things that shine: Trending: Feathers. Part 3. DIY! When I first started looking at handmade feathers, I was amazed at the sheer artistry that goes into some of them. And I thought, there is seriously no way I can do this. But, the more I looked, the more I realized that for all of the artistry that goes into feathers (paper and real), that they are essentially quite basic. And I thought, I can do basic. As a simple shape, a feather is really just a somewhat curvy, kinda long and skinny type shape. As having pattern, it really just looks like there are lots of fine downward pointing lines running the length of the center spine. Basically: long + chevrons = feather. Then whatever else you want to add in is just details. A pointy bit at the bottom for the quill, maybe some texture up the sides for the notches that gives each feather its unique shape. 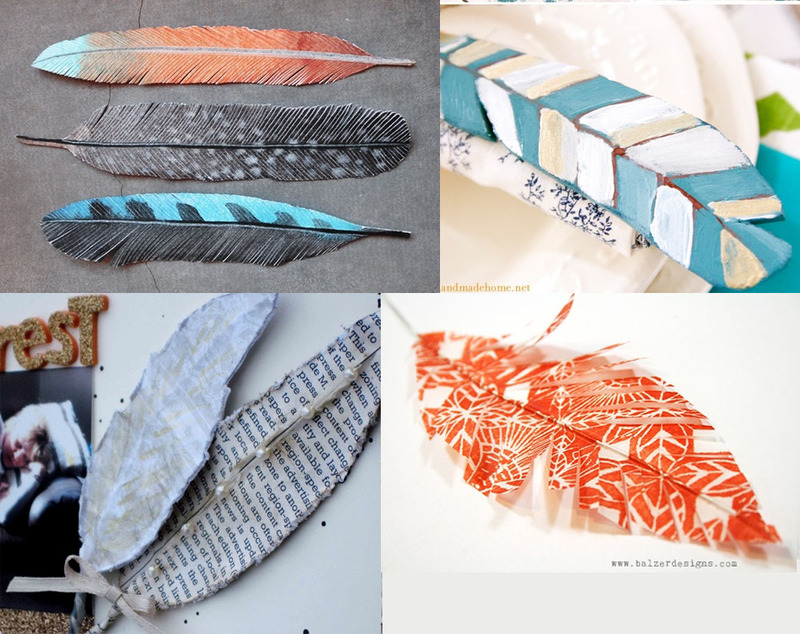 (Sources: Water colour feathers by Geninn's Art Blog; painted feathers by the Handmade Home; 3 different paper feathers by Lintsi; and deli paper feathers by Balzer Design). Starting at the top left corner above, the water colour feathers above are so realistic! I love the combination of the precise painting and the delicate fringe. The bold chunky coloured veins on the painted feather is a fun and modern treatment. The Handmade Home made these out of foam, but you could easily replicate the look above using raw chipboard, cardboard, or even kraft cardstock. I love the texture Linti adds to her paper feathers with some gentle crumpling and other simple but impressive distressing techniques. In the bottom right corner we will finish up with that fun fringed feather made from deli paper. Be sure to check out the blogs above for helpful DIY instructions, and visit my Feather Board at Pinterest for more paper feather ideas. (Sources: gilded feathers at Mom's Crafty Space; glitter feathers at The Nester; stamped feathers at Organize and Decorate Everything). There are so many amazing version of gilded feathers out there, but the ones shown above I find especially amazing. I love the way Mom's Crafty Space combined silver and gold, and mixed up the patterning. This is definitely one feather I need to try! Gilded feathers are such a fast and easy to way to dress up *anything*. What's not to love here? Glitter -- GOLD glitter -- and feathers. Like a perfect, pretty storm. And although I have yet to try it, I am totally in love with stamping on feathers. How great would a title stamped on a feather be? I can totally see using these in decor, on cards, maybe even on wedding or Christmas gifts as part of the wrapping! What a brilliant use for all of that colourful baker's twine or embroidery floss I know we all have too much of! 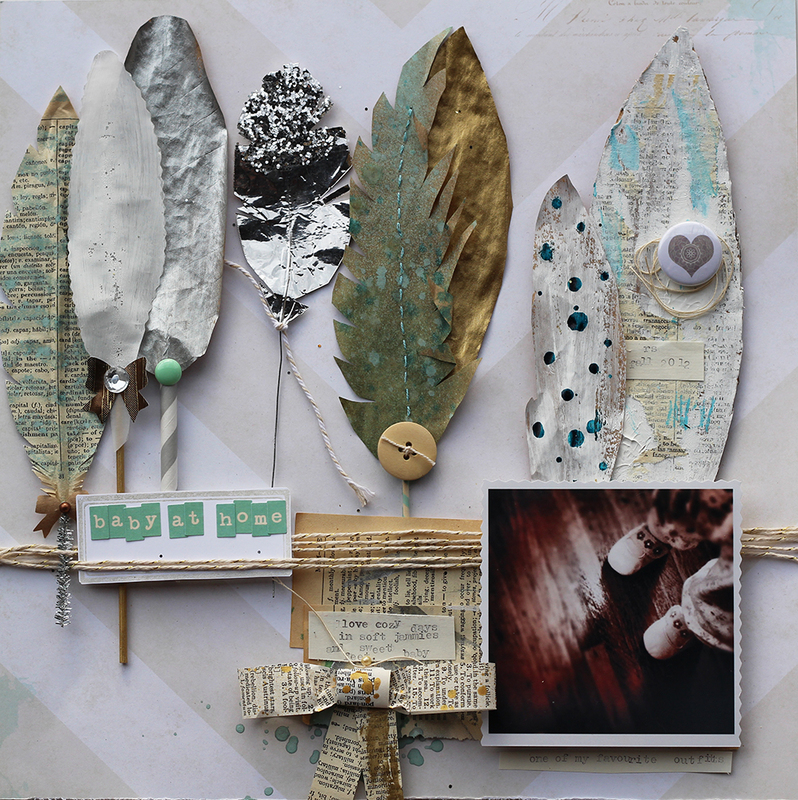 I love the added gold chevron detail Blue Sky Confections added to her twine feathers. I love neon and I love feathers, so I am sure it is no surprise to you that I seriously love these neon green duct tape feathers by Brit+Co. Yes, that's right.. duct tape.. neon green duct tape. And before you raid the fix-it box in your basement for some duct tape to try making these bright beauties with, think about checking out the craft or hardware store for some super fun patterned stuff. I hope that one of these fine feathery ideas has struck you full of inspiration, and you're dying to get crafty and DIY some feathers! If you are looking for more inspiration or ideas, take a look through my Pinterest Feather board, where I've been collecting feather ideas to share with you all. Leave a comment on this post for a chance to win a wonderful package of feather goodies supplied by some wonderful companies! Give-away will be on February 28th. Leave a comment on each installment of my Trending Feathers article for another entry for a chance to win! Give-away open to US residents only. Give-away prizes provided generously by: Jenni Bowlin Studio; Cocoa Daisy; Creatiate; Fall In Love Gems; handmade feathers by Ashley Calder and the Things That Shine, and A Flair For Buttons. Tune in Friday for my fourth and final feathery installment in this trending series!